The exhibition entitled HER, is an exploration into the artist’s idea of womanhood and female identity within contemporary society. The surreal characters in Aka Chio’s twenty illustrative drawings, depict the diverse state, condition and role of women. We are pleased to announce the first solo exhibition of work by Aka Chio. Presented and organized by AC Arts Company and Jam Cast Management (HK) Ltd. together with ZZHK Gallery, HER is an exhibition and sale to benefit the Hong Kong Federation ofWomen's Centres, opening reception with the artist in attendance on Thursday, 21 December, 2017 at ZZHK Gallery in SheungWan. Sale proceeds of the exhibition will benefit HKFWC’s Women's Relief and Support Fund. The exhibition entitled HER, is an exploration into the artist’s idea of womanhood and female identity within contemporary society. 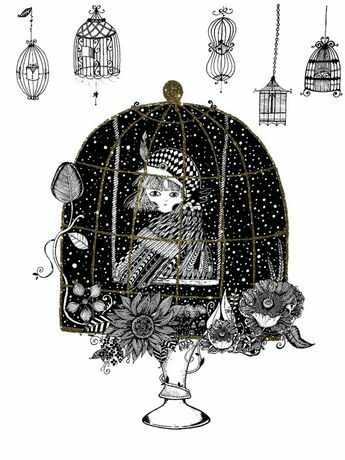 The surreal characters in Aka Chio’s twenty illustrative drawings, depict the diverse state, condition and role of women. Chio has always been concerned with the issues of women’s rights and welfare, such as trauma in marriage, financial and parenting stress and the difficulty in seeking help. By using pen and ink on paper and focusing on the visual power of black and white, Chio recreates these fictitious female characters that she imagines, which is amixture of people that she has seen in real life, in films, media and comics, bringing the work together into this exhibition is to draw attention to these vulnerable groups of HER. 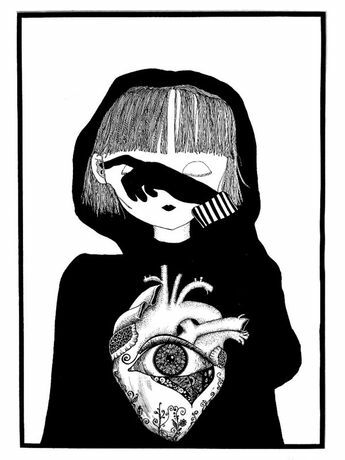 In her work Eye of Heart, Chio cuts out the figure’s eyes, leaving it hollow and half covered with a hand, while a bright eye glowing inside HER heart, SHE will see with HER heart. 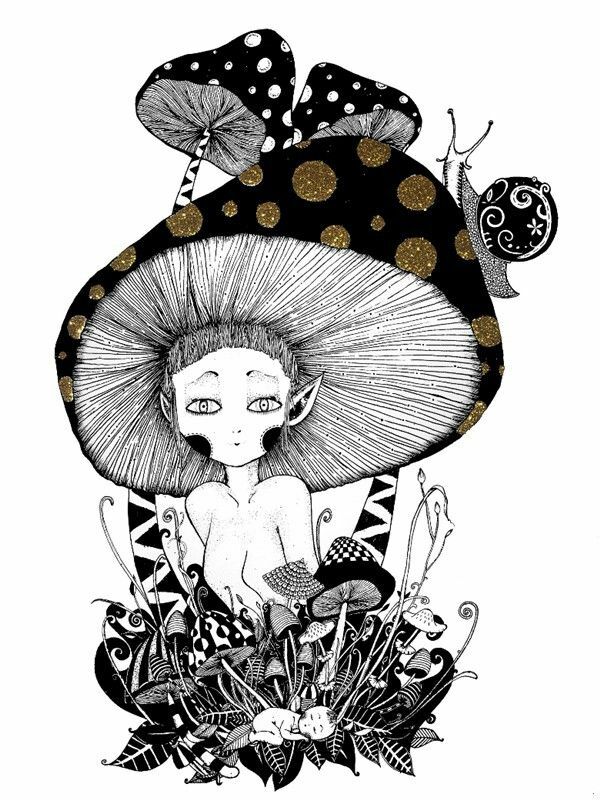 Poison is Poisonless, illustrates the baby mushrooms growing exuberantly under the shelter of the big poisonous mushroom, indicating the delicate relationship between mother and child. 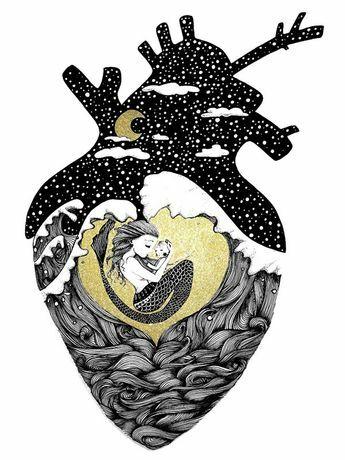 In another work in this exhibition, titled Heart in Heart, a woman is transformed into a mermaid guarding her baby in a tsunami night. In the work The Cage, a woman was trapped in a golden cage symbolizing the situation where women have no gateway to freedom and feel like trapped, isolated and dejected.